The roadside memorial still looked fresh on April 3. 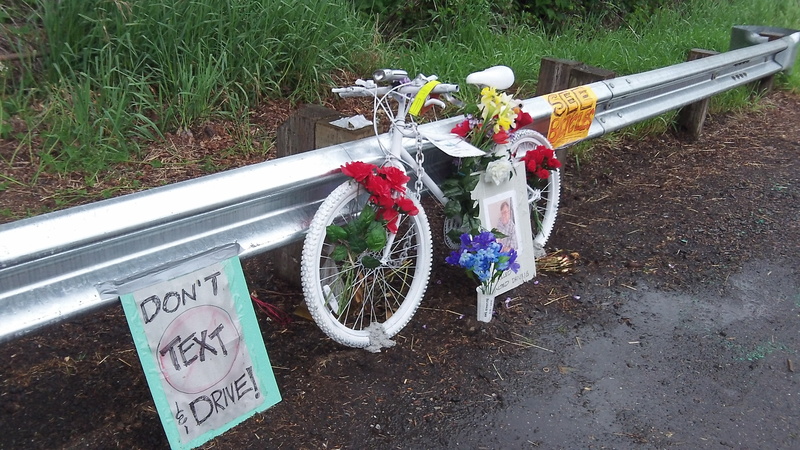 Deputies have mentioned speed, not texting, as a possible factor in the crash. .
You’d be wrong if you thought everybody but the family had forgotten about the death of Albany bicyclist Grant Keith Garner last Feb. 17. In fact the case continues to be under active review of potential charges against the driver who lost control of the car that killed him. The crash happened near the curve where Oakville Road becomes Queen Avenue. Garner, 60, was riding his bike west, on his way home after work, when a 2000 Subaru Legacy was coming the other way, failed to make the turn, ricocheted between guardrails and hit him, according to the Linn County Sheriff’s Office. He died at the scene. Deputies identified the driver as Than Xuan Nguyen, 24, of Corvallis and said she was treated at the scene for minor injuries and was cooperating with the investigation. They said alcohol was not a factor in the crash but excessive speed may have been.